The 2012 Presidential Debates, featuring Democratic candidate President Barack Obama and Republican candidate Sen. Mitt Romney, began Wednesday, Oct. 3, at the University of Denver, Colorado. 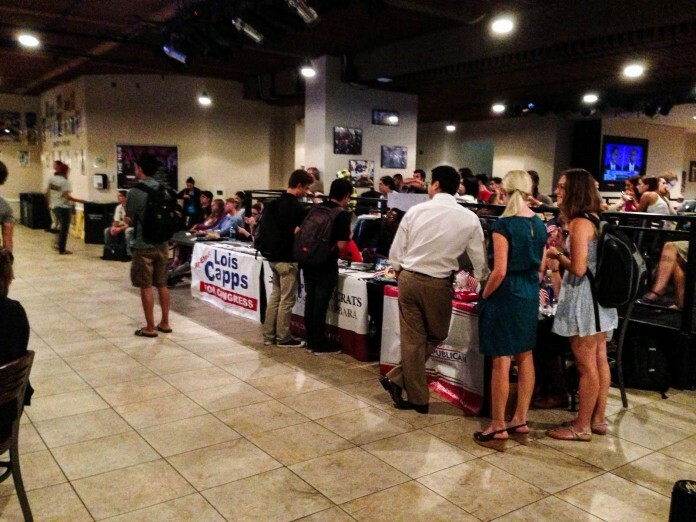 The Hub welcomed any students with an interest in the upcoming election to sit among their peers to watch the first of three presidential debates. “The student body flooded into The Hub for the presidential debate,” said Ian Wikle, a second-year chemistry major who attended the event. The crowd showed great attentiveness to the broadcast; around the room, the masses had their heads turned toward the debate. Debate moderator Jim Lehrer posed questions pinpointing a variety of aspects of the economy to the two candidates, including their plans for fixing the economy, increasing the number of jobs available in the United States, improving the national debt and handling Medicare. Questions involving revenue and taxes took precedence. Each candidate came up with different budget plans outlining their goals and focuses, encompassing who would receive higher tax rates, who will be allowed tax breaks, and who will receive government funding—military, alternative sources of energy and numerous government programs. The debate also touched on other topics, including federal regulation and healthcare (with an emphasis on “Obamacare”). Despite different strategies and outlooks, both candidates displayed a desire to improve America’s economy. The candidates continually exceeded Lehrer’s given available times to answer the questions. Both candidates were to blame for pushing the time limit; Romney continually countered Obama’s statements, and at one moment in the debate, Obama told Lehrer, who had attempted to cut the President’s statement short, “I believe I had five seconds left before the interruption,” and proceeded to orate for three additional minutes. University of California Santa Barbara’s professor of political science, Eric Smith, who received his Ph.D from UC Berkeley with an emphasis in American Politics, Public Opinion and Voting Behavior, Environmental Politics and other areas of political science explained that most who watch the debates are decided voters who view the debate with bias toward their candidate. Taking it a step further, he explained how undecided voters typically do not educate themselves on economic, tax and revenue plans and would not be able to follow the content of the first debate. “I think the debate was somewhat of a wash…I doubt it will have any significant effects on the polls,” said Smith. Still, some of Obama’s supporters were disappointed due to his apparent lack of enthusiasm and his display of uncomfortable irritation throughout the debate—a contrast to the confidence and poise he has shown as an orator in the past. As the election draws nearer and voters cement their opinions, Obama and Romney will continue to discuss their platforms as candidates in the next two weeks when the Presidential Debates continue on Oct. 16 and 22.